These products are only available in the United States. The 'room in a room' is a concept that Vitra has intensively pursued over many years in collaboration with the designers Ronan and Erwan Bouroullec. The idea of mobile micro-architectural elements has led to a wide variety of designs, among which the Alcove sofa stands out as one of the most remarkable. The various Alcove sofas were conceived for open-plan offices, where they provide sheltered, private spaces in busy or hectic surroundings. This makes them a perfect place to withdraw for concentrated work or small meetings. The different models in the Alcove family can be variably combined, thus offering a diverse range of possibilities for organizing open-plan offices without having to install fixed structures. This enables the creation of cohesive central areas in open office environments – Meet & Retreat zones with a unified aesthetic. Materials: Upholstery: Alcove sofas 'lounge upholstery' for relaxed sitting. Structural frame: Chrome-plated upholstery webbing (lounge upholstery) Body: High back and side panels form a visual and acoustic shield, integrated MDF boards for structural support, panel sections connected with zip fasteners. Upholstery/seat: Polyurethane foam and polyester fiber. Covers: Removable. Back cushions and cushion set: Polyurethane chips and microfiber filling. The cushion set is sold separately. 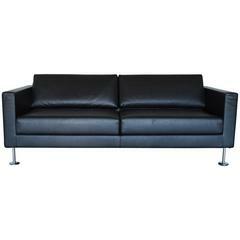 Legs: Chrome-plated steel Alcove sofa: incl. 2 back cushion. Cushion set for sofa: 2 armrest cushions and 2 small back cushion. Dimensions: Width 238 cm Depth 86 cm Height 94 cm Seat height 48.5 cm. Laser(F40)06/tubular steel frame01. Pair of Alcove Xtra high three-seat sofas designed by Ronan & Erwan Bouroullec for Vitra. Original Laser panels upholstery in 09 Green. High quality Riri zipper.